If you've owned a car for awhile, chances are you've locked your keys inside. You can pay to have a professional break into your car for you, or you can just learn how to do it yourself to save both time and money. Note: This should go without saying, but do not use this knowledge to break into someone else's vehicle. That is illegal and not particularly nice. Use this to unlock your car when you lock your keys inside. According to YouTuber assertivecrystalgg45, all you need is a door stop/wooden wedge and a long metal rod. To break in, you insert the wedge into the top part of the driver's side door until it makes a small opening. 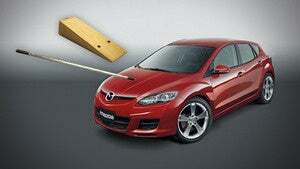 Then you can stick the long metal rod into that opening and use it to push the unlock button on the car. This works much better with electronic locks but can be done with regular locks as well. If you have a normal lock, you may also be able to use a crimped plastic strap to lift it into the unlocked position. Which method will work best will depend on what type of locks you have, so before you go out and get your materials be sure you're getting the right stuff. Personally, I was able to break into my car using a small putty knife instead of a wedge. A wedge would've been more effective, as a putty knife is flat, but thanks to the old days of Mac mini hacking that's what I happened to have lying around. Presumably a wedge will work better since it can create a wider opening. This won't be a problem when it comes to getting the rod through the door, but it should make it far easier to navigate the long way to your tiny unlock button. If you have any ticky tack (or something sticky) to put at the end of the rod, this also may make it easier for you to push difficult and/or small buttons. All in all, this looks to be a very effective method for breaking into your own car so long as you have these tools handy. Despite how it may look, it's pretty easy to do this without damaging your vehicle. If you can manage to only lock your keys in the car when you're home (or near a hardware store), you'll be in good shape!